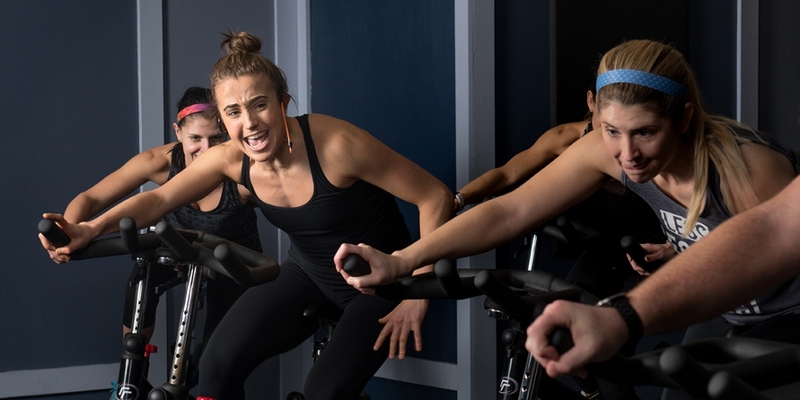 Power Ryde is not just another fitness studio, but a community of like-minded people who ryde together, sweat together, and support one another. Simply put, our mission is to bring people together to workout. But those who come to Power Ryde know, it is so much more than that. We offer awesome high-intensity indoor cycling classes on bikes that allow us to tilt side-to-side and work our entire body. Classes are led by an instructor who will teach to the beat of the music, which makes the class fun and allows the time to fly by. With the lights low, the disco ball on, and the music pumping, it is easy to get lost in your own pedal stroke. But, the one thing that sets us apart from many fitness studios and cycling chains, is the sense of community we have created. We make it a priority to focus just as much on our clients and community as we do on the actual workout. When we opened our doors in 2013, we made it our goal to integrate Power Ryde into the local community. We made a point to get to know every single one of our ryders and introduce them to other ryders. We started offering FUNdraising Rydes to raise money for local organizations, charities, and families in need. We celebrated our ryders' birthdays and achievements. What started as a workout studio has grown into a community-based fitness studio where ryders come to see their friends and their workout buddies. In each class you can expect to hear someone hooting and hollering because the camaraderie and support is so strong. Whether our regulars know you or not, they will cheer you on and support you; that's what makes the Power Ryde experience so great, our community.